Few garden plants grow faster or taller than the Thuja Green Giant. This enormous and vigorous evergreen shoots up rapidly. Thuja Green Giant plants quickly tower above you and, in a few years, grow taller than your house. For more information about Thuja Green Giant plants, also called Green Giant arborvitae, read on. Trees and shrubs in the Thuja genus are fast-growing evergreens. They are more commonly known as arborvitae and feature dark green foliage. Some species develop bronze streaks in winter. While arborvitaes have lost some of their popularity with gardeners in recent years, the cultivar ‘Green Giant’ is an exceptional plant. A vigorous and beautiful evergreen, Green Giant (Thuja x ‘Green Giant’) grows rapidly into a pleasing pyramidal shape. Green Giant arborvitae have flattened sprays of scale-like leaves. The foliage is bright green and darkens a little in the colder months. It never bronzes like the Oriental arborvitae. Look for a white line on the bottoms of the leaves of these plants. It is faint but adds a touch of brightness to the foliage. 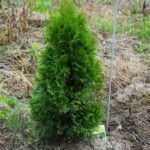 If you are thinking of growing a Thuja Green Giant, you’ll need to measure the potential growing site. These Thuja evergreens, which were imported from Denmark several decades ago, grow into enormous plants. Green Giant arborvitae shrubs may be small when first transplanted. However, they grow quickly and mature to some 60 feet (18 m.) tall with a basal spread of up to 20 feet (6 m.). Obviously, you won’t want to start growing one, or even a few, in a small garden. These trees are great choices if you want to create a large, evergreen screen, however. Often, the size of these evergreens limit their use to parks and large properties where they make excellent, year-round screens. 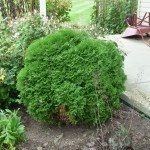 Growing a Thuja Green Giant doesn’t require exceptional effort if sited appropriately. These plants thrive in U.S. Department of Agriculture plant hardiness zones 5 through 7. If you are wondering exactly how to grow a Green Giant in these zones, find a sunny site large enough for to accommodate its mature size. Consider both the mature height and breadth. The type of soil is not critical since most soil types, from sandy loams to heavy clays, are suitable, although they prefer deep, moist loam. They accept either acidic or alkaline soil, and transplant easily from a container. When you are considering how to grow a Green Giant, remember that these are easy-care plants. You can shear them if you like, but pruning is not necessary. Irrigate them during dry weather even after establishment to ensure that your plants stay healthy.